Phaplu Everest base camp trek follows the footsteps of famous Edmund Hillary and Tenzing Sherpa and ends with an ascent of Kala Patthar. 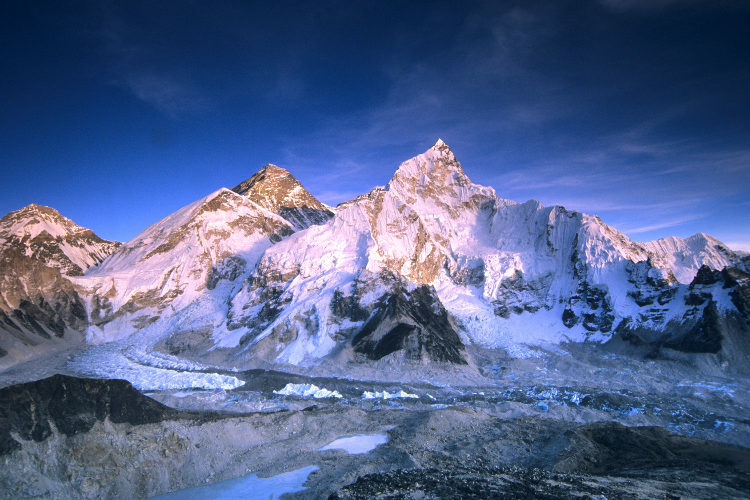 Kala Patthar is known as mountain black stone, the best place for a viewpoint. Base camp hike everest starts an with an express overland jeep drive from Kathmandu to Phaplu. It is another best option rather than adventure flying to lukla. While on the road drive you will have a witness with an amazing landscape, hills and the colorful valleys. Along the walking journey base camp trek to everest, you can see the tallest mountains, brilliant landscapes, high valleys with the Human settlements, the mountain villages and Buddhist monasteries. Furthermore base camp tours everest has great opportunity to experience getting the sherpa hospitality. Base camp trek mount everest conducting from Phaplu is located in Sagarmatha national park which is listed under the UNESCO world heritage sites. Phaplu to everest base camp trek nepal is always most demanding hiking route to see the highest mountain of the world, Everest at 8,848m, and many of the world’s 8,000m peaks such as Lhotse, Cho Oyu, and mount Makalu. Everest Icefall glacier with huge ice pinnacles soaring to unbelievable height before reaching the Everest Basecamp. From Phaplu to everest base camp distance is roughly 60 kilometers on way. Base camp tours everest is suitable for all age walker looking for something a little bit tough challenge. Our program always includes rest days and build up gradually, in order to acclimatize to the altitude. On your trekking to Everest, you can walk at your own pace, with a lot of stops for rest. Salleri/Phaplu to Everest base camp trek drive in fly out is reasonable for the individuals who need to get very much acclimatized amid the trek rather than direct arriving at Lukla air terminal. Everest trek route beginning from Phaplu rise up to Kalapatthar hill has dependably the best time to visit in March, April, and May in the spring season while the national blossom Rhododendrons are sprouting and the woods swings to the beautiful. Moreover, visiting Kalapatthar and base camp is likewise the best time in September, October, November, December while the days are sun sparkling, clear skies and beautiful green slopes and the valleys. If you are upbeat to fly lukla helicopter, you may tweak spare your excursion by 2 days. From Phaplu bazaar to Everest base camp trek route plan is handmade by our expert tour operator Ammar Raj Guni. Climb to Hillary Everest is conceivable to do in any months through out the year. Phaplu Everest base camp trek detail itinerary. Conducting from Phaplu to Everest base camp trek is an express trek tour, 17 days itinerary compared to most walks in this region leading up to the base camp. The particular route is designed for world travelers who wish to hike to the base camp of the spectacular mountain but are restricted time-wise. For travelers who wish to reach the Everest base camp in a more relaxed manner can try this itinerary however if this itinerary is not ft you than send us an inquiry for tailor-made itinerary. Day 02Drive to Salleri bazaar (2,300m/7,521 ft), 10 hours drive. Early in the morning, we start to drive from Kathmandu to Salleri by a local Jeep over the blacktopped road. It is newly constructed road. We will have the best view the panoramas of Riverside, jungle, wonderful landscape and the scattered villages. We cross the bridge at Sunkoshi River and continue through Okhaldhunga. On the way, we can see the incredible peaks as Dudhkunda (Numpur Himal), Everest and many other snowy peaks. Then it is a continual drive up and up, which takes us to the district of Salleri of solukhumbu. Overnight at Lodge. Day 03Trek to Taksindo (3,070m/10,039 ft). 6:30 hours. After breakfast, we start our foothill journey. It goes through the countryside road, which is wide and after our entire hike, today is easy and comfortable. The view of Numpur Himal is awesome and the local scenarios accompany it. The trekkers, who fly to Phaplu from Kathmandu for 25 minutes, have also the same route for trekking. We cross small streams and hill gorges. From Fera, we walk through Pine forest to reach Ringmo. We walk furthermore 2 hours to reach Taksindo. We enjoy the first-day trek and take a rest. Overnight at Lodge. Day 04Trek to Kharikhola (2,010m /6,573 ft), 6 hours. From the hill of Taksindo, the picturesque scenarios of Salleri can be explored. The monasteries of the village represent mystical touch with Tibetan Buddhism. From another ridge, the views of Lukla, Nunthala valley astound us. Then we descend through the alpine forest, pass the Nunthala village and continue trek downhill walking to cross Dudhkoshi River and get up to Jubing and ascend about 2 hours we reach Kharikhola. Overnight at Lodge. Day 05Trek to Paiya (2,770m/9,058 ft). 6 hours. From the hill of Taksindo, the picturesque scenarios of Salleri can be explored. The monasteries of the village represent mystical touch with Tibetan Buddhism. From another ridge, the views of Lukla, Nunthala valley astound us. Then we descend through the alpine forest, pass the Nunthala village and continue to trek down, cross the Dudhkoshi River and get up to Jubing. After about 2 hours ascend, we reach Kharikhola. Overnight at Lodge. Day 06Trek to Monjo village (2,850m/9,347 ft), 7 hours. The trail climbs for about an hour after Puiyan to a ridge at 2800m, then up to another ridge. Passing through Lukla Airport follow a gentle climb up the mountainside on the left bank of the Dudh Koshi River. Along the way, you will have a view of Mt Nupla (5,885m), Kusum Kangaru (6,367m) and the Mount Kwongde Range. We have an easy rough trail to get Benkar village and walking about 1 hour further we can reach Monjo village. We stay overnight at lodge. We continue along the trail with many ups and downs; cross a stream, and pass by the tiny village Monjo. We then come to Sagarmatha National Park office where we a park entrance fee is to pay. We follow a short walk along the riverbed of this valley where the major river meets each other. Crossing over the Hillary bridge, the trek begins steep ascent to Namche Bazar. On the way, we would have excellent views of Everest (8,848m) and Lhotse (8,516m.). Surrounded on three sides by mountain ranges, Namche Bazar (3,440m) is a central hub of the area for food, trekking gears, and other necessary goods. Discover around Namche Bazaar and its surrounding! At the afternoon after Lunch, We walk above the clouds to syangeboche hill station. We enjoy the splendid view of Mt. Everest, Ama Dablam, Thamserku, Nuptse, Lhotse, Tawche, Kwangde with several other popular mountains within a row within the 360-degree angle. While descending to Namche, we would visit the National Park Museum (if you have enough time) just above the town that exhibits Sherpa culture. Having breakfast trek heading towards Tengboche Monastery. The trail goes ahead leaving a steep cliff that drops down to the Dudh Kosi. During the journey, we would have a panoramic view of the Himalayas such as Ama Dablam (6,812m), Everest, Lhotse, Nuptse (7,855m) and Tawoche (6,501m). We would visit Trashinga, Phunki Tenga and reach Tyangboche. Tyangboche offers a good view of sunrise and sunset at Everest and Ama Dablam. We trek from Tyangboche to Dingboche (4,260 m.). Leaving Tyangboche at the backdrop, we descend through a rhododendron forest and enter Deboche. Crossing a suspension bridge at Imja Khola, we head towards Minlinggo and inter Imjatse Valley beneath the mighty peaks of Ama Dablam, Nuptse and Lhotse. We finally come to Dingboche. Today, we acclimatize at Dingboche to be familiar with the local climate. Today, we hike to Dingaboche hill to get acclimatize. Hike to Chhukung is optional, it also provides majestic view of Island peak, Ama Dablam, Makalu, Tawoche peak and others. In the late afternoon, we come back to Dingboche and take rest. It is our turn to head towards Lobuche from Dingboche which is situated at a distance of five and half hours normal walk. The onward trail is gentle up to Pheriche village. Along the trail, we would be privileged to have panoramic views of the Mt.Tawache, Ama Dablam, Pokalde (5741m), Kongma-tse (5820m) and the great wall of Nuptse. We would have lunch at Dugla (4595m) and trek to Lobuche. Having breakfast at Lobuche, we trek to Everest Base Camp via Gorakshep (5,140m.). It is the most rewarding section of the trek. Our trail winds up through rocky path and Khumbu glacier. The view of Nuptse, Lho-La and Khumbutse appear at a stone throwing distance. Visit Everest Base Camp and come back to Gorakshep. We trek from Gorakshep to Kala Patthar (5,545m.) and trek to Pheriche (4,243m.). Early morning, we get ready to climb Kala Patthar (5,545m.) and enjoy the view of sunrise. We would see Mt. Everest, Mt. Pumori, Mt. Lingtren, Mt. Khumbetse, Mt. Nuptse, Mt. Lhotse, Mt. Ama Dablam, Mt. Thamserku and many more from Kala Patthar. Himalayan Rescue Association Aid Post is available at Pheriche health post where foreign volunteer doctors are providing medical treatment. Trek from Pheriche to Tengboche (3867 m.). We would visit the research center and trek to Tyangboche. During the route, one can enjoy descending through rhododendron forest. Teangboche is famous for the oldest monastery. From the monastery, one can enjoy the splendid view of Ama Dablam, green hills and pristine river. Finally, trek descends from Tyangboche to Namche Bazaar (3440 m ) passing several villages. Sanasa and Lagusasa are the most famous one. You will catch the way descends from Gokyo valley. We trek furthermore twenty minutes to find a lodge for lunch and a short pause. After Lunch at Sanasa, we hike up to Khumjung village where one can visit traditional villages landscapes. You might also visit Hillary Hospital located in Khunde. And in the meantime, we follow the trail to Monastery which offers Yeti Scalp. Finally, we come to Namche Bazaar in the late afternoon. Day 17Mountain flight from Lukla to Kathmandu. How much does Phaplu Everest base camp trek cost? Does anyone know what about base camp everest trek cost?. Because of one way flight, the trip cost is a little cheaper then you expect. But hike Phaplu to Everest base camp is available now on USD 1,525 per person is on double occupancy basis. But of course, the trip price will vary according to group size. For the deluxe and luxury trekking tour plan, we add 3-star category hotel deluxe air-conditioned room in Kathmandu (BB PLAN) and Tourist standard accommodation with attached bathroom while on trekking on possible places. AND WE ARE OPEN TO CUSTOMIZE YOUR TOUR AND PACKAGES PRICE AS PER YOUR REQUIREMENTS. International tour leaders are highly encouraged to get discount and attractive complimentary. Kathmandu to Salleri of solukhumbu district by local jeep (passenger collection basis) transfer. Required number of porters during the trek. (one porter = two guest basis) because our each porter can carry maximum 24 kilogram of your bag pack. All land transfer by Private vehicle according to above travel plan. We can organize your private trek from Phaplu Everest base camp trek starting at any date that works for you. Please contact us for more information. Question: Do I need experience for Phaplu Everest base camp trek? Question: What kind of accommodation can I expect on phaplu to Kalapatthar Trek? Question: What kind of food can I expect in Phaplu Everest base camp trek? Question: What opportunities will I have for a shower along Phaplu Everest base camp trek? Question: How do I get drinking water on Phaplu Everest base camp trek? Answer: Most of all places hotel and shops where you can able to buy mineral water and you can buy it for drinking but however we advise against buying mineral water in plastic bottles, as currently there are no provisions for disposing of these. Instead, we provide you with boiled water or bringing chlorine tablets to purify the normal water as the normal water is available in campsite/along the way on camping trekking. Answer: During the Tea house trekking there will be more chances to charge the battery. We recommend you bring an extra pair for in case. Remember to bring your own adapters! Question: Is there any communication facilities on Phaplu Everest base camp trek? And regarding the deposit, we prefer 20% advance deposit of the total price of the trip in order to confirm your reservation before you arrive in Nepal. And the rest of the payment can be made after your arrival in Kathmandu. Question: Who will carry my luggage on Phaplu Everest base camp trek? Question: Do I need walking polls for Phaplu Everest base camp trek? Phaplu Everest base camp trek Notice ! We booked our trek to EBC via Ammar at Gokyo Treks and Expedition.